On January 17, 2014, Team Sarah will go on knock out rounds to see who among the camp will be able to go on to the Live Shows and continue to be the contenders to wards the voice of the Philippines. The second group will be comprised of the artist chosen by Sarah herself. Jason Dy sang the ‘Jar of Hearts’ while Carol Leus performed ‘Open Arms’. Douglas Dagal on the other hand did his rendition of ‘I Believe I Can Fly’. Sarah had chosen them in a group because of their charm. Jason Dy had chosen a song to express a heartbreak different from the genre he used to sing, particularly the love songs. Sarah asked him to lessen his vibrato and his ad lib. Carol wanted to take the risk to be different too from her usual performance. Sarah asked her to express her heart. Douglas wanted to show his experience through his chosen song, Sarah asked him to have more stage performance. Jason Dy was able to show stage presence. People seemed to hold their breaths as he sung the song different from his usual serenade songs. Others artists said that anger could be seen in his expressions. Carol was able to deliver with her heart while Douglas was able to express inspiration through the iconic song. Bamboo and Apl had rooted for Douglas. Leah said that Douglas was able to show his heart through his song. Sarah said that Jason was still able to catch hearts. She said that Douglas was humble despite his experience while Carol still has a lot to reach in her future career. 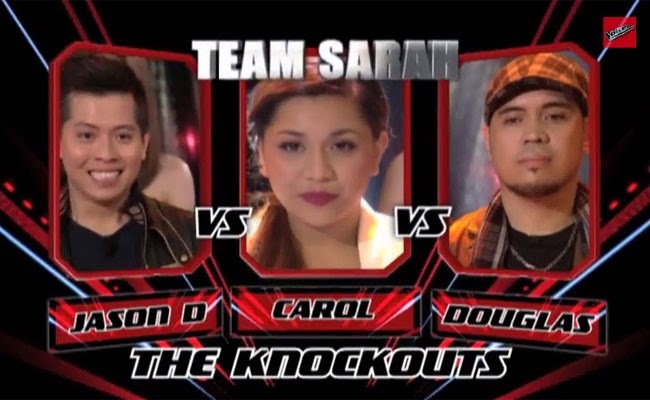 Monique Lualhati and Poppert Bernadas who were the firsts to enter the top six of Team Sarah had been joined by Douglas Dagal and Jason Dy.